Lately I have started another adventure which I called “MI VIDA EN COLOMBIA” which actually did not start exactly in Colombia. I was planning to do my internship for almost two years but my primary plan was to do an AIESEC internship in Brazil! However, because of the legal and visa issues, I did not get the chance to do an internship in Brazil, and I decided to do it in the north of South America – in COLOMBIA! Reason was simple – nice climate, amazing language, friendly people (at least everybody says that about Colombians) and perfect place for starting the South American Backpacking Trip which I plan to realize after my internship finishes! So here we go – I contacted one girl from AIESEC Monteria who posted an opportunity to come to Monteria and to teach English at Universidad del Sinu and after couple of weeks I was already accepted and all of the necessary documents for the visa process (although with some complications) were sent to me! Teaching at university was supposed to start on 20th of April and my training was supposed to start couple of days before this date, however, my very good friend from Slovakia (my lovely Monika – my soul mate from my Erasmus exprience in Spain) persuaded me to book the flight tickets to RIO DE JANEIRO on 10th of April till 21st of April, therefore, I was not able to come to Monteria sooner than April, 20. I was aware of the fact that the beginning of my internship in Monteria would be very hectic and chaotic, especially because of my late arrival and lack of any information regarding my teaching programme, but the idea to spend at least 10 days in the country where I wanted to do my internship on a first place, was so tempting that I could not say NO! Therefore, before my arrival to Monteria, I spent 10 amazing days with one of my best friends in Brazil in cities like Rio de Janeiro, Petropolis, Armacao de Buzios and Arraial do Cabo. I met incredible people, experienced awesome moments and I have never regretted my decision about coming to Brazil first. 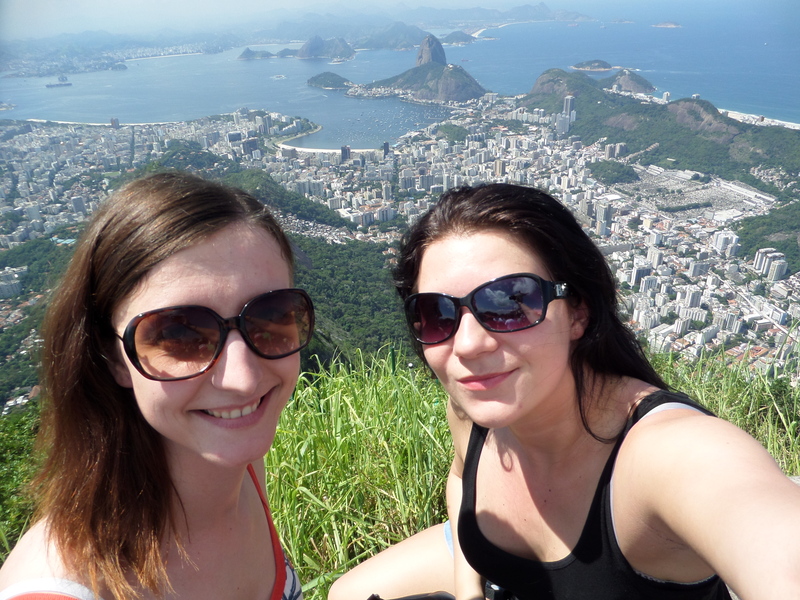 Monika & me with amazing view on RIO de JANEIRO!!! On my destiny day – April 20th – I took a taxi from my Bed & Breakfast apartment directly to GIG international airport in Rio de Janeiro from where I flew to Bogota (six and half hours) where I spent another three and half hours waiting and where I got the official stamp to my passport at immigration control which allowed me to stay in this beautiful country for one year! In the afternoon hours I took another flight to Monteria where I arrived after one and half hour of flying. The first thing I noticed after the landing in Monteria was the HEAT, incredible hot weather and humidity, in spite of the fact it was already 7pm. I was picked up by the girls from AIESEC Monteria and my “buddy” Gustavo who took mi directly to my new home in the area of Recreo. I met my new host family consisting of my new Colombian mama Mariangela and her son Carlos. I found out that three more Colombian girls lived in the apartment, what pleased me, as I came here with purpose of learning as much as possible about Colombian way of life, culture, people, their habits and tradition. And the best way how to achieve that is to work and live with COLOMBIANS! After my first night in Monteria, or generally in Colombia, during which I did not have enough of sleep as I was not able to sleep properly – maybe because of some kind of internal nervousness from the next day, I was about to start my internship at Universidad del Sinu where I arrived early in the morning in order to meet heads of language office, my colleagues and of course my Colombian students! During the first two hours at the university I absorbed as much information as I was capable! After the introduction meeting I was required to go to the city centre to the Immigration Office in order to register my stay in Colombia and afterwards, exactly at 12:00 I started my first introduction lesson with my first Colombian students. And the first impression? Just great! Students were amazingly friendly, respectful, curious and willing to learn! My second class took place in the evening hours. The students from the second group were willing to take me around the university and show me the most important places around uni, helped me to buy my new Colombian phone card and moreover went with me by the same bus to my home area in order to get home safely! This act of willingness, to help me to feel like at home, left very good impression on me! To sum up, although I had very busy and hectic first days in Monteria when I had to absorb a lot of information about my new host family, internship, students, and when I had to (and wanted to) meet plenty of new people and get in touch with new culture and language, MY FIRST IMPRESSION ABOUT MONTERIA AND GENERALLY ABOUT COLOMBIAN PEOPLE IS MORE THAN AMAZING and it is difficult to describe it by words….